Hhhhmmmmm....ajvar....I love it! It is addicting and good with everything actually. Thanks for telling me that Trader Joe's sells it. So is Whole Foods! I didn't know and never check their shelves for it. I always buys the Zergut brand which is bright red or Indo European. I haven't tried your recipe since it is so easy for me to buy it. I should have to save money. The quesadilla is a good idea and looks so good. So far I've eaten it with corn chips, on a adzuki bean 'n rice burger, and plain. This stuff is really good. 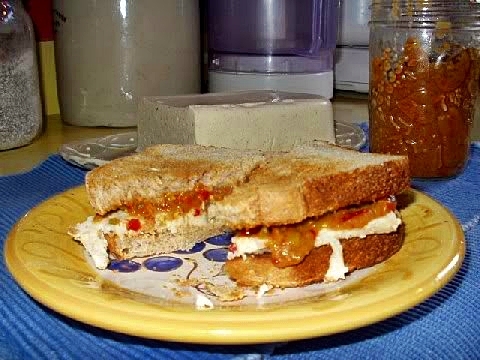 I made two other sauces this weekend (one pumpkin and the other yelloe pepper based ... this one tops! I'll be buying another eggplant today so I can make some more. Don't forget the zucchini version, Dori! What a great use for all the eggplant and zucchini I seem to have around the kitchen! Mmmmm...Non-subscribers, you are lucky to get this recipe!!! Copy and save it, ASAP, and guard it with your life -- it's awesome. :D.
Guaranteed you'll find a way you like to use it! Bryanna, you are amazing and so are these recipes! I love this kind of food SO much! WoW Thanks, Very nice recipe, I am defently going to try it. This looks so good! 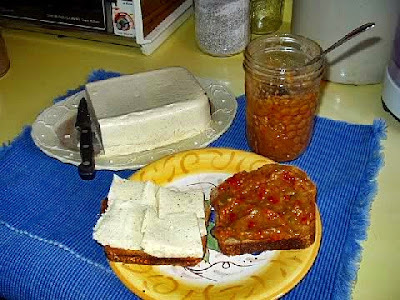 My friend from Bosnia got me hooked on Ajvar, and I sent this recipe to her. We are fortunate enough to have a local store that has Ajvar and other really yummy things like the pickled peppers stuffed with cabbage. FYI, in San Antonio, Tx you can get this at Ali Baba on Wurzbach and IH 10. 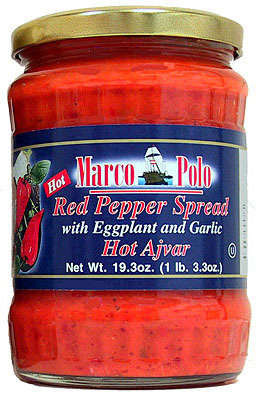 This is NOT the way to make ajvar. What follows is the authentic recipe. After grilling and peeling, Ajvar vegetables are minced and cooked in a pot with lots of oil, which is added incrementally. The vegetables release water, which is slowly mixed in with more and more oil. After 2-3 hours, all the water evaporates and it becomes a smooth emulsion (creamy water-oil mixture) with bits of vegetables. You must stir and cook until the liquid evaporates. To preserve wash the jars in a dishwasher and fill them still piping hot, adding a little hot oil on the top to seal from air. They will not spoil. Garlic is added serving time, as it will spoil the ajvar. Well, Balkan Boy, I try not to use "lots of oil", so this is my method, which is adapted from many recipes I researched in books and websites on Balkan cooking. Everyone has their own way of making traditional recipes, as I know from being part Italian! 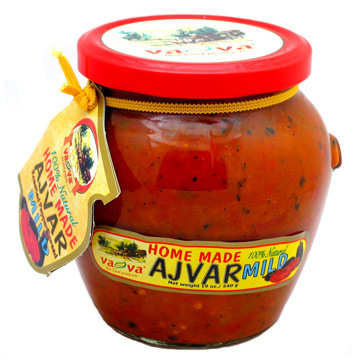 It tastes delicious and I have not had any complaints from ajvar users! I'm also aware that you can water-bath can it, but I usually make it in small batches, so I just refrigerate it. Adding garlic to the mixture certainly does not "spoil" the mixture (at least, not for short-term storage), but it would certainly be more garlicky to add it before serving, so that's a good tip! You are not quite right. Ajvar is originally from Serbia (NOT from Macedonia or Croatia) , and is also known as "Serbian salad" or "Serbian vegetable caviar"